Iwadateo Shrine (石楯尾神社) is established in the time of 12th emperor Keikou. 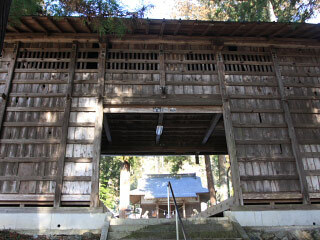 It is one of the oldest shrine in Yamanashi. Iwatate was the worrier who defeated Fujiwara revolt in 764. The Kagura hall was constructed in 1845. It is very unique because the stage and gate are combined. There is parking. No restroom. 1. use JR Chuo Line to Uenohara Station. 2. use local bus to Iwatateojinja. Iwatateo Shrine was established in the time of the emperor Keikou. The Royal General, when Yamatotakerunomikoto conquared eastern land, he brought the shield and settled it here to enshrine the first emperor Jinmu.